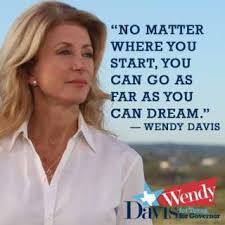 “Attacks” on Wendy Davis Sexist? I’ve seen repeated claims the “attacks” (their word) on Wendy cover the kind of material that’d never be checked into on men. Look at the list belowand see if the “fact-check” on Wendy’s bio is breaking new ground, or if, like the Joe Biden / Neil Kinnock plagiarism flap or the stories about Romney’s dog or Edwards/Clinton/Kerry/Cain or Gingrich’s marriages, Bush’s DWI, Bush and Gores college grades… it’s standard operational procedure? –Are you aware Obama won 2 Illinois elections when his male opponents sealed divorce records got leaked? –Do you recall why Herman Cain bowed out of the last presidential field? –How do we know Obama smoked dope in high school? –Is there a reason I’d know the names Fawn Hall, Donna Rice, or Jessica Hahn if males in high office were never scrutinized? –What happened to presidential frontrunner Gary Hart? –Did you by chance listen to the confirmation hearings of Robert Bork? How about Clarence Thomas? –Did anyone mention Romney’s incident in high school where he cut someone’s hair? Or how he transported his dog on a vacation once? Did anyone posit (falsely) he hadnt paid taxes in a decade? –How do I happen to know GWB had a DWI? –Why would I know Al Gore’s college grades were lower than George Bush’s? –How could any of us possibly be aware Joe Biden got nailed in college for plagiarism? Or that he later plagiarized a speech by a Canadian pol almost word for word including personal anecdotes? –How do you suppose the public found out a president frequently referred to as a constitutional law professor never actually held a professorship? –How do we know the name of a previously obscure intern that worked for Bill Clinton. Or the names Gennifer Flowers, or Paula Jones? –Why do I know Gingrich is apparently an atrocious husband? –How do any of us know about John Edwards cheating ways? –Why would I know John Kerry made his fortune marrying an heiress, divorcing her, and marrying another? –Do you recall any discussions about John McCain’s marital status? –What happened to Arnold Schwarzenegger’s political career? If you lie or exaggerate about your qualifications, someone will catch it. Nature of the beast. And for heaven’s sake, after the press dug through Sarah Palin’s trashcan, her childrens lives, her husband’s politics, etc… the left’s claim that simply fact-checking Wendy’s bio is somehow beyond the pale is pretty darned funny. Getting caught plagiarising Neil Kinnock’s speech cost Biden his first run at a presidential nomination. Some pols overcome their screwups and live to fight another day, some do not. Wendy CHOSE to put forth a bio that suggested she heroically clawed her way through TCU and Harvard as a single mom. That simply wasn’t true, but she let people buy it cause it sounded more heroic than the truth. Now Wendy is paying the same price any man who made the same mistake would pay… she’s getting pounded in the court of public opinion. That’s not sexist, that’s politics. Grow a tougher hide or quit lying. You’re dead on, as is usually the case. Once again this is evidence of that annoying phenomena where a double standard is being insisted on in a political matter. That dog just ain’t gonna hunt. Well, not unless you’re hopelessly partisan anyway. If this old girl cant run with the big dogs, she needs to sit on the porch. Politics is a blood sport. Always has been, always will be.